My Little Pony Arena » Forums » Pony Talk » Off Topic » A Gargoyle?? Forums » Pony Talk » Off Topic » A Gargoyle?? Posted: 0 Post subject: A Gargoyle?? In 1995 I purchased (at Wal-Mart) a little green & silver gargoyle for my daughter. She was christened LaLa the Dragon (*our* name for her, I'm pretty positive) and was Gayle's constant companion. LaLa made it easier to leave the farm & Mommy & go to school. LaLa heard many secrets. And one day, LaLA encountered a Rat Terrier! Now, I don't hold anything against the dog, poor fellow was just doing what he was bred to do... which was, I gather, tearing a toy into tiny bits. Gayle was crushed, and the remains of LaLa are in a little box on a shelf in her room. 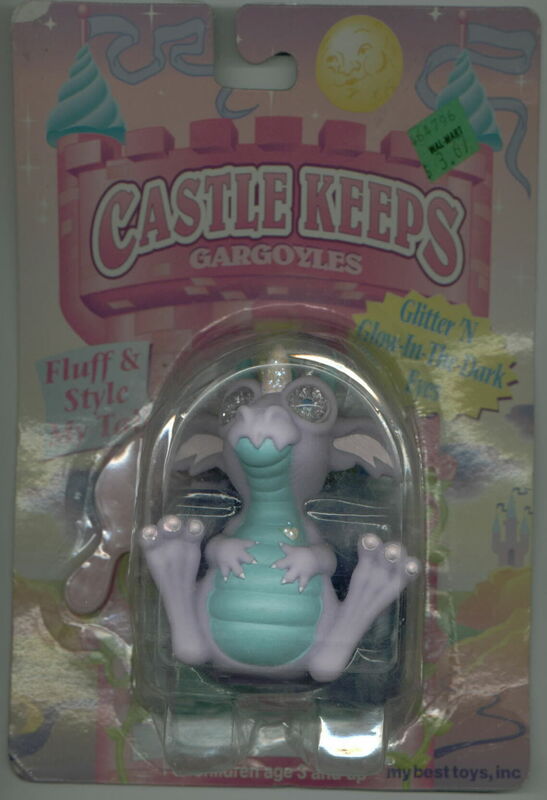 I've begun searching online (Ebay, toy forums, MLP sites, Fakie/Phony sites) for our little baby gargoyle. She was green, with a silver belly & little silver horns. Her eyes were pink jewels, and she had a long pink tail, with a little brush to groom her. I know this little toy must've been made by a fakie/phony manufacturer, but I've not been lucky - yet! Please let me know if you've ever seen such a toy... I'd be thrilled to find one for Gayle! Posted: 0 Post subject: Re: A Gargoyle?? I haven't but if I ever come accross it I will let you know, good luck! I'll look around - maybe one will show up in a store like Value Village. Poor toy to meet such an end. Hmm.... I'll keep an eye out. 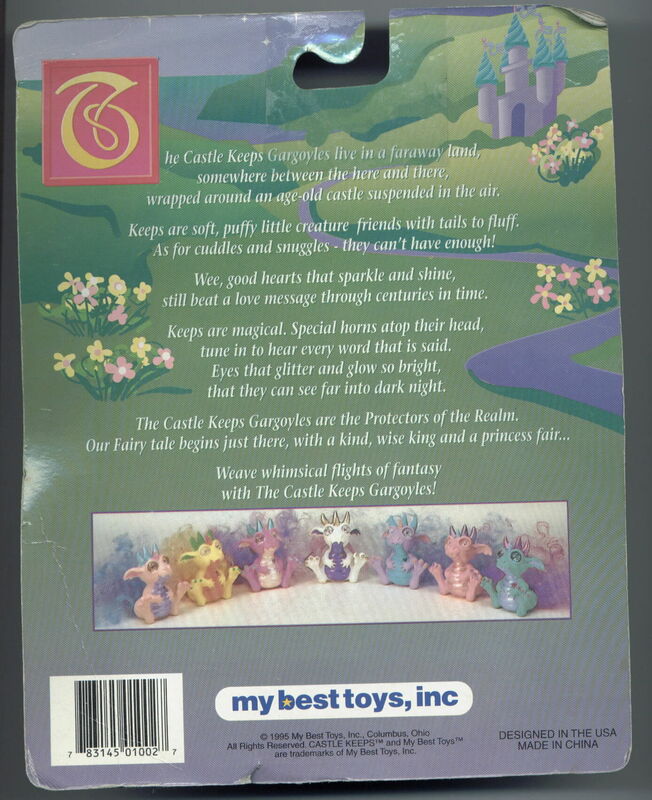 If you still have the peices of the toy, can you show us a picture of it so we get an idea what to look for? I hope this really is what you're looking for, so now you'll know for sure what they're called and the name of the company that made them. Best of luck to you in findsing the one you're after. HOLY COW, i didn't realize those were the full-size scans! Sorry for the massive pics guys! Next time I'll make sure they're manageable before posting them! Maybe you can copy and paste the URL and see the pictures? I've copied them below. If your browser automatically resizes the picture to a more manageable size, you can hold your cursor over the picture and click on the symbol that appears over the bottom right corner, and that will bring it back up to full size. I hope these URLs work for you! You can't direct link to pictures hosted on Angelfire, and copying/pasting or clicking your links don't work either, at least not for me. Avatar and Sigs thanks to Rainbowjuice and Sirithfin! Well, actually, if you don't click on the link, but copy and paste it, it should work. Angelfire apparently has set up roadblocks. :-( Here you go...I'll set up a page just for them! Haha, weasel your way out of THAT one Angelfire! ..the pictures don't work on the page either, maybe you could try photobucket. Ah finally, that one worked! wow, I have never seen those before! but I am more of a Target shopper. I'll keep my eyes peeled and let you girls know if I stumble upon any. now that i see the pictures, wasn't someone on here trying to figure out what they were not too long ago? they thought it was a dragon though, maybe i can find the post..
here's the thread about the toy, it was Aoshi-dono wondering what it was but no one knew. Ponies with 6 written on them are from my childhood collection! Please PM me if you find them.